Wake Forest University awarded six honorary degrees during its commencement ceremony May 21. 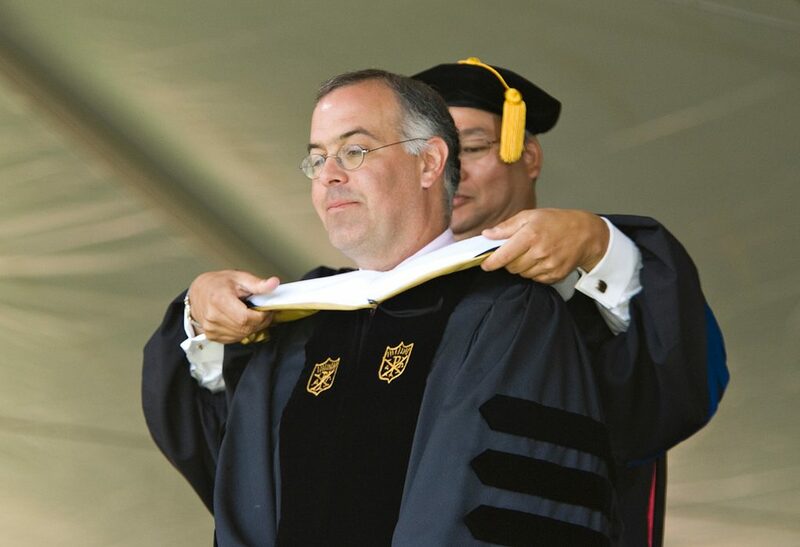 The morning ceremony featured New York Times columnist David Brooks as speaker. 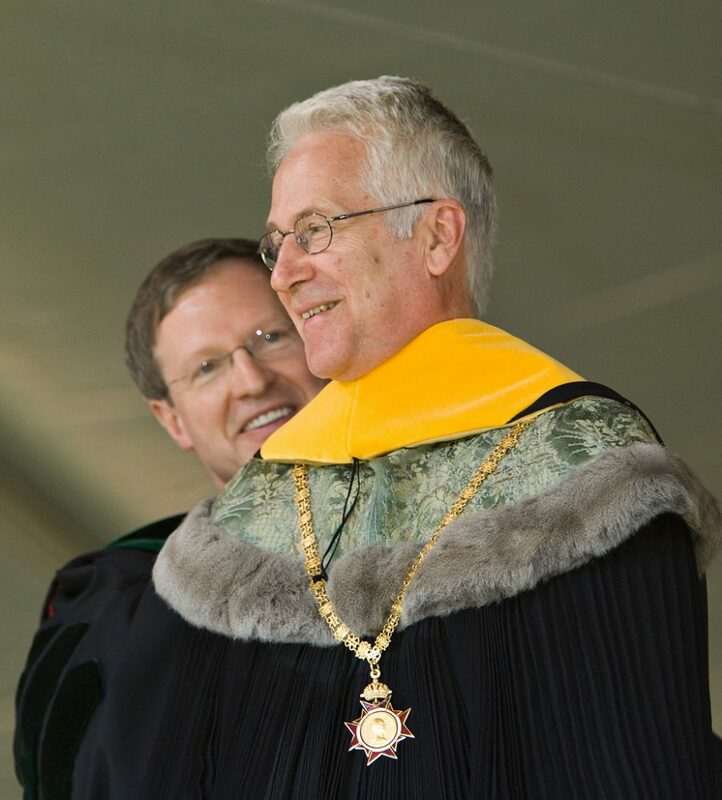 Brooks was presented an honorary doctor of humane letters degree following his commencement address to the approximately 1,500 graduates on the university’s Hearn Plaza (the Quad). In addition to Brooks, five other distinguished individuals received honorary degrees during Wake Forest’s commencement ceremony. The Rev. 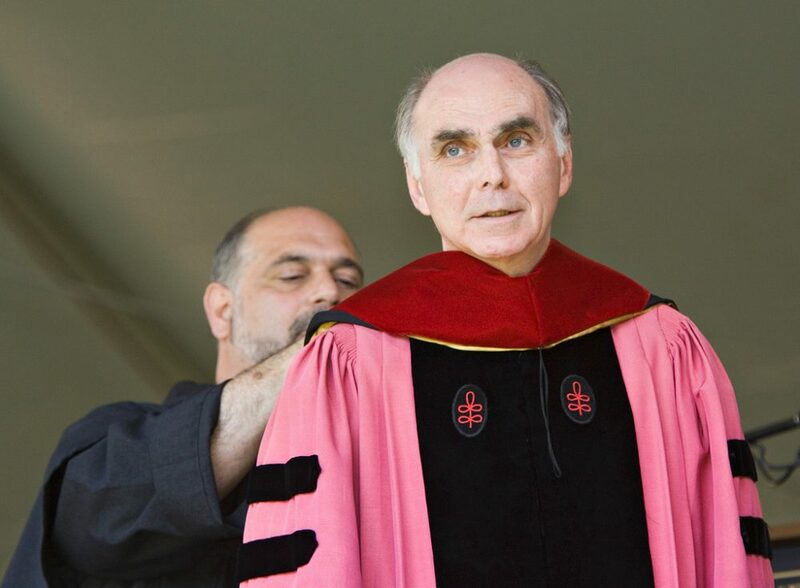 J. Bryan Hehir, a Catholic priest and the Parker Gilbert Montgomery Professor of the Practice of Religion and Public Life at Harvard University, received an honorary doctor of divinity degree. Hehir gave the keynote address at the university’s May 20 baccalaureate service in Wait Chapel. Hehir is also the secretary for Social Services and the president of Catholic Charities in the Archdiocese of Boston. His research and writing concentrates on ethics and foreign policy and the role of religion in world politics and in American society. He is best known for his influence on the 1983 pastoral letter on war and peace, “The Challenge of Peace—God’s Promise and Our Response” issued by the U.S. Conference of Catholic Bishops. 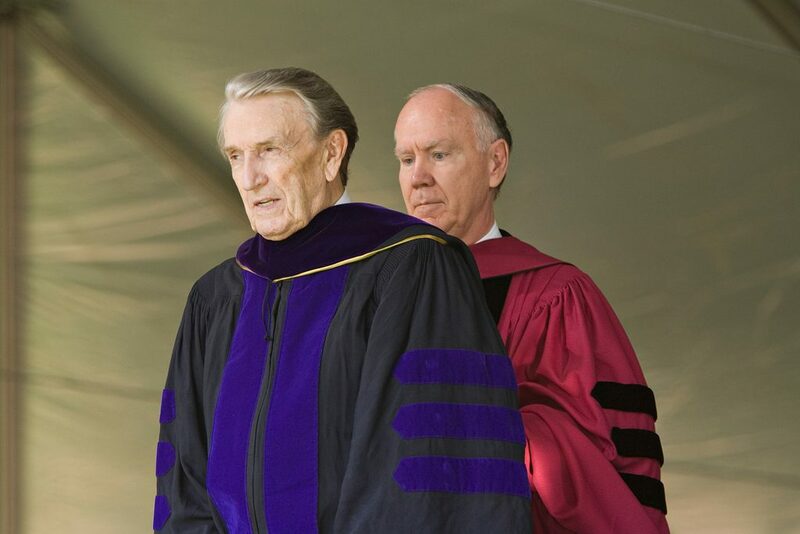 The university awarded an honorary doctor of laws degree to Dale Bumpers, former Democratic senator of Arkansas. Elected to the U.S. Senate in 1974, Bumpers served four consecutive terms. He is known for his oratorical skills and his respect for the U.S. Constitution. He is proud of his legacy of never voting for a constitutional amendment. Bumpers also served as ranking minority member of the Senate Committee on Energy and Natural Resources from 1997 until his retirement. Prior to serving in the U.S. Senate, Bumpers served two terms as governor of Arkansas. Throughout his public service career, he fought to protect the health of children by promoting school immunizations. Bumpers is credited with helping the United States reach a record high level of immunizations. In honor of Bumper’s work, former President Bill Clinton established the Dale and Betty Bumpers Vaccine Research Center (VRC) at the National Institutes of Health to facilitate research in vaccine development. 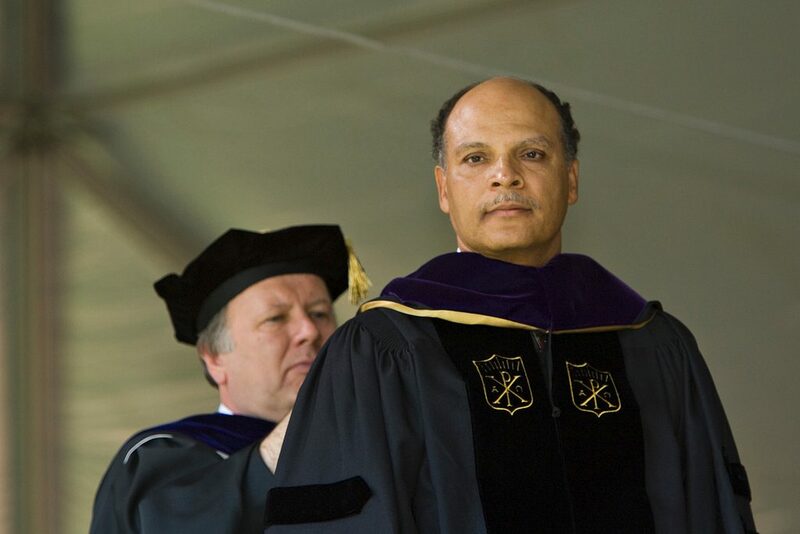 Harold L. Martin Sr., senior vice president for academic affairs at the University of North Carolina, also received an honorary doctor of laws degrees. A native of Winston-Salem, Martin is the former chancellor of Winston-Salem State University (WSSU). During his term, enrollment nearly doubled, freshman SAT scores rose and the campus underwent a dramatic physical transformation. Among his numerous accomplishments, he is credited with raising the quality and breadth of academic degree programs, initiating programs to improve student retention and graduation rates and initiating WSSU’s largest capital fundraising campaign in history ($35 million). Wolfgang Schutz, president of the Medical University of Vienna and a world-renowned pharmacologist, was awarded an honorary doctor of science degree. Schutz has dedicated his life to the study of the science of medicine. He began his career in the department of pharmacology at the University of Vienna in 1974. Throughout the years, he has served as a professor, dean of the department of pharmacology and dean of the school of medicine. Two years ago, Schutz and Richard Dean, president of Wake Forest University Health Sciences, signed a General Agreement of Academic Exchange between Wake Forest’s School of Medicine and the Medical University of Vienna, officially acknowledging a long-time collaboration. Schutz is the editor of Austria’s Pharma-Information, a journal of the International Society of Drug Bulletins, serves as chairman of the Board of Drugs for Austrian Social Insurances and is a member of the Committees for Drug Safety and Drug Approval for the Federal Ministry for Social Security and Generations. 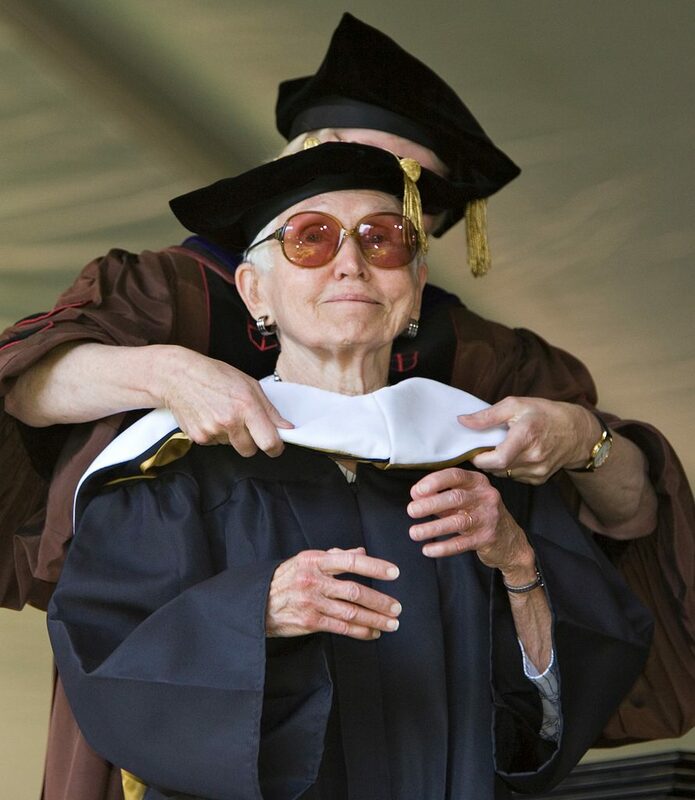 Anne Firor Scott, the William K. Boyd Professor Emerita at Duke University, received an honorary doctor of humane letters degree. Scott is a pioneer scholar of women’s history and is a prolific scholar of the South. She holds the distinction of being the first woman to chair Duke University’s history department and was the first professor at Duke to include women’s scholarship in her teaching and research. She has taught at Duke for 40 years. Her first book, “The Southern Lady: From Pedestal to Politics, 1830-1930,” was published in 1970 and has never gone out of print. It was the first book to be based on the study of women’s personal documents and is considered the book that established the modern study of southern women’s history. Scott is also a recipient of the Distinguished Service Award from the Organization of American Historians.